Forest Animal Feeding Day (Dzień Dokarmiania Zwierzyny Leśnej) is an unofficial nature-related observance in Poland celebrated on February 11. Its main task is to help the inhabitants of the Polish forests to survive the hungry times during winter. 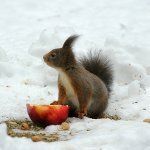 According to statistics, forest animals and birds in Poland have to survive an average of 25 “hunger days” each winter. The term “hunger days” refers to the days when animals can’t procure food because of thick snow and only get a half of their normal daily food ration or even less. To help forest animals survive such days, Polish forestry employees feed them. For example, deer get tree branches and sprigs, hay with legumes and grass, cereal, and juicy vegetables (beets, carrots, cabbage) as a source of water and vitamins. Wild boars get corn, beech and acorns, while birds (sparrows, blackbirds, partridges, etc) get seeds. Small animals are fed near bushes to make them feel safe but far from tall trees to prevent them from betting attacked by birds of prey. Feeding forest animals in winter has its pros and cons. On the upside, it improves the living conditions of animals, increases their breeding potential and thus helps to preserve populations. Beside, well-fed animals are less likely to destroy crops. On the downside, animals get used to depending on humans, and their natural dietary preferences change. Therefore, people should only provide help when there is a real risk of hunger.